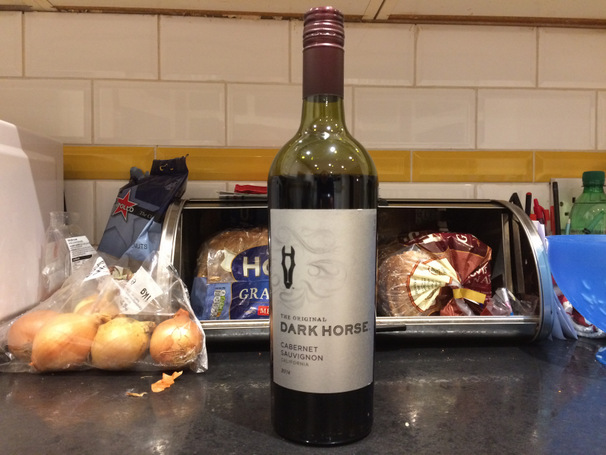 The Original Dark Horse is a Cabernet Sauvignon from California. As the name Dark Horse suggests Cabernet Sauvignon is one of the richest, darkest reds you can sample. The Original Dark Horse is a beautiful example of the genre. It looks good in the glass. It has a deep purple tinge like freshly squeezed blackcurrants. As it enters the mouth there is the first hint of bitterness, which is quickly overwhelmed by a tidal wave of fruit and vanilla. The vanilla has an echo which is sill reverberating five seconds later. The strength and bitterness gives it maturity, one doesn’t want to get to carried away with sweetness. It leaves the back of your mouth feeling slightly chalky, but in a good way, in a way that suggests you drank well. For my money its the closest you’ll get to the fantasy of drinking velvet. Went exceedingly well with a chilli con carne. Note to reader: If you’re wondering whether we like it or not after reading the review, know that we only feature wines that taste damned good!